Home Local News Marshfield Fire & Rescue Responds to Vehicle Fire on Central Ave.
Marshfield, WI (OnFocus) Marshfield Fire & Rescue was dispatched at 10:35 a.m. Friday, March 22 for a vehicle fire at 7th Street and Central Avenue. Engine 1, 2, and Ambulance 96 responded. Upon arrival, responders saw that there was a vehicle in the middle of the intersection that had caught on fire. Fire Engine 2 started fire attack and knocked down the fire, which was underneath the vehicle and inside the passenger compartment. 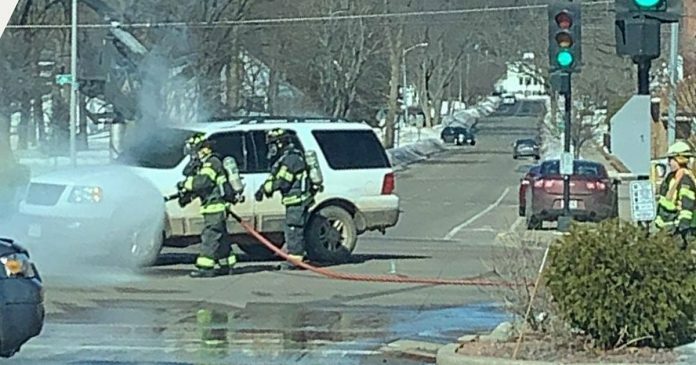 The fire was extinguished and there were no injuries to the occupants, who had already escaped by arrival, and no medical transports were required. The vehicle was removed and crew stayed on scene to clear the intersection of debris. Preliminary cause of the fire appears to be a compromised fuel line which caused a leak before igniting.